AOL Support - What to do next? I am posting on behalf of my Brother in Law and Sister who are with AOL Broadband. They have had issues with AOL Support and I wondered how it's best to proceed. Around 1 week ago, Broadband and Phone Line stop working. No dial tone and no internet access. Both the line and internet are with AOL BB. Bro in Law calls AOL up, the advise an engineer will attend to resolve. An Openreach engineer does attend, and he advises the local exchange has had cables stolen from it. When they finally get "reconnected" OR have wired his neighbours number to his line, so he gets her calls. That has now been resolved, but he's not getting any calls at home and still no internet. AOL support seem to be a nightmare. Can anyone suggest any good idea's to get this resolved? Re: AOL Support - What to do next? If he is not getting calls, then the fault has not been resolved, and keep on at AOL to chase their suppliers to fix the fault. Also discuss compensation for the period service was not working, this generally wakes a provider up. I will see what the situation is with him later, after he finishes work. Has anyone else had dealings with AOL? They have been assured by AOL that an engineer will go to the local exchange to repair the fault by the end of the week. I have been told they are now waiting for BT to come out, and finish things off..
Not exactly sure what is meant by that.. but fingers crossed ! Seems a long time if he is not getting calls. Does he have dialing tone? Can he dial out? Loss of landline should be fixed by BT within 24 hours, never-mind the BB. Whatever the offer is, I have never given up my phone line from BT, I find this is the only way to go. I am not keen on the format of BT broadband especially the way the email is handled.and am used to the AOL setup. Having said that I find g-mail quite useful. I have not yet spoken to my Sister about this, however as I am seeing her this weekend I will try and find out what happened.. Sorry I cannot provide further info. 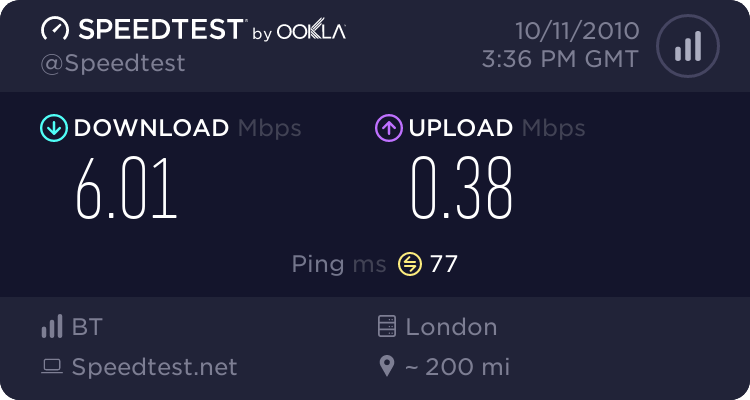 potentially a LLU provider would provide better speeds, however IF BT offer a good deal to keep the Line Rental and BB with them for another 12 months I am sure my parents would stay with them..
As to my Sister, I think they are now going to ditch AOL for good.